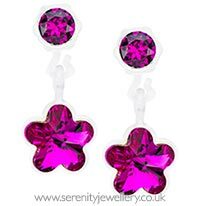 Hypoallergenic medical plastic dangly earrings with 5.5mm flower shape Swarovski crystals in 6.25mm wide settings hanging from 2.75mm Swarovski crystal studs with 4mm bezel settings. These earrings come with medical plastic butterfly backs. 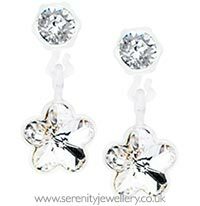 Having discovered the amazing medical plastic brand, I can wear earrings again and I was excited about receiving a silver pair of these flower drop earrings for Christmas. My first pair of ''danglies' since 1999! Unfortunately, they're not the dangly earring I thought they were - they just sit awkwardly on my ear lobe and look rather weird. The flower itself keeps twisting round as it's not a flat shape. I've resorted to separating the stud from the flower and now just wear them as tiny pretty silver stud earrings. I'd love a true dangly pair of Blomdahl's, but these aren't right for me. 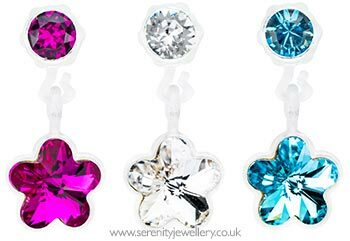 I've been waiting for you to stock some drop earrings which also have a stud on the lobe... 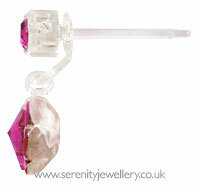 These are just right; delicate with a hint of 'bling'. Not 5 stars as I'd prefer them in metal. Please consider this for next season. Very nice. My daughter loves the color. She already has few other pairs. These drop flower earrings are beautiful! I have the flower stud earrings, so I wasn\'t sure if I would like the drop flowers, but I love them! I got them in violet, and they are so beautiful! I have already gotten many complements, everyone wants to know where I got the beautiful flower earrings! They also have a larger plastic back than the drop hearts have, and that is really nice.